One of the brothers describes a week he spent in New Zealand in September 2005. It began when a music teacher from a high school in Christchurch visited Taizé. Once back in New Zealand, she spoke about it to the religious education department of the Catholic diocese, as well as to the Anglican priest who had prepared my earlier visits. ... The result was a whole week’s program of visits and prayers in Christchurch. 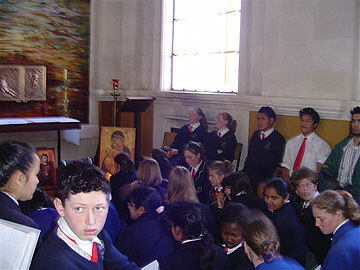 That involved many visits, meeting a lot of people: religious educators, youth workers, an ecumenical group of inner city clergy, the Synod of the Anglican diocese of Christchurch, the Sunday Eucharist organized specially for the young people in St. Joseph’s parish, then the afternoon in St. Michael’s . . .
Amidst all those meetings, I was greatly encouraged by the contacts I had with several hundred students from the various Catholic and Anglican schools. I was invited to spend one whole morning attending the music classes in Cathedral College. The students were learning to sing and accompany the songs from Taizé. Some of them were Maoris, others had come from Tonga, Samoa, Fiji, others even from India. It was a wonderful chance to explain how our music came into being, how to be attentive to the words being sung. In the classes, there were several flutes, guitars, a cello, a trombone, a trumpet etc. They quickly understood that their role would be to support the prayer of the rest of the students, not to “perform,” that by playing their various instruments, they would be helping everyone enter into this kind of repetitive singing, in such a way that the Word of God they were singing could gradually penetrate deep into their hearts. As I explained some of the songs, I could feel that their way of playing changed. That evening, they led the prayer around the Cross in the Cathedral of the Blessed Sacrament, and although there were so many musicians it was almost an orchestra, they had so completely integrated the words of the songs into their way of playing that it was an extraordinarily prayerful evening. Two days later, students from several schools, St Bede’s, St Thomas, Villa Maria, Marian Colleges, came together for a time of sharing and a beautiful midday prayer that was led by the same group of musicians. Another aspect of the journey was the chance I had to go out to small towns that usually no one visits. On Saturday afternoon, we went to Timaru, more than two hours outside of Christchurch. By not only visiting the large centers of population, people who cannot travel are able to participate in a prayer and at such times there is such a welcome, so much joy, that the whole time of prayer is made festive.